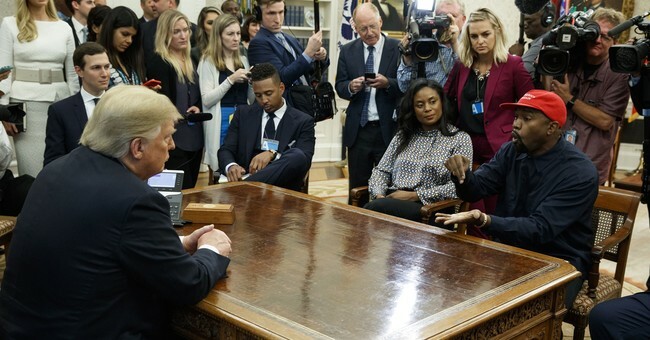 Kanye West stopped by the Trump White House today to discuss prison reform, among other things. He mentioned the right to bear arms, the problem of illegal firearms, and a whole host of issues that certainly triggered the elite news media. The clip will be featured down below. Kanye then walked over and hugged President Trump. You knew once that happened, West was going to be torched by liberals who cannot stand him saying nice things about Trump and his message. Anchors and guests on CNN and MSNBC have argued that Kanye’s mental health issues are a reason not to take him seriously and have suggested that his support for Trump is a side effect of his diagnoses. MSNBC anchor Stephanie Ruhle said shortly after Kanye’s Oval Office visit that the White House is taking advantage of his mental illness. “I would suggest that the president should maybe curtail these types of engagements,” the California Democrat asserted.